Please refer to our stock # 3305 when inquiring. 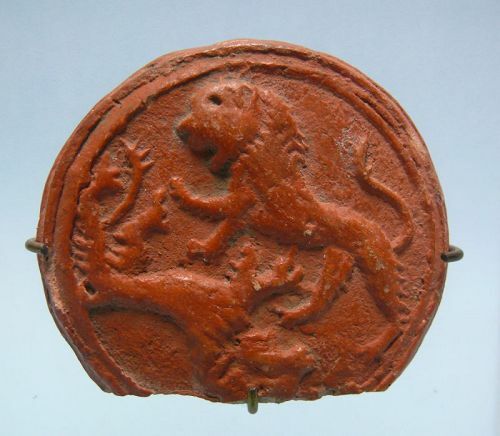 Roman, North African, Terracotta, Red Clay, Mold of Two Lions, 1st Century CE. 2 1/2" diameter, on custom stand 4 1/2" high. Ex: S. Beiner collection, Florida. The designation 'fine wares' is used by archaeologists for Roman pottery intended for serving food and drink at table, as opposed to pots designed for cooking and food preparation, storage, transport and other purposes. Although there were many types of fine pottery, for example, drinking vessels in very delicate and thin-walled wares, and pottery finished with vitreous lead glazes, the major class that comes first to mind is the Roman red-gloss ware of Italy and Gaul make, and widely traded, from the 1st century BC to the late 2nd century AD, and traditionally known as terra sigillata. These vessels have fine, fairly hard and well-fired buff to pink fabrics, with a naturally glossy surface slip ranging in color from light orange to quite a bright red. The variations in the color and texture of both body fabric and slip, as well as the vessel-shapes and the designs on the decorated forms can enable a trained student to identify source, date and often individual workshop quite accurately. Arretine ware, made at Arezzo in Tuscany, was the pre-eminent type of fine pottery in the 1st century BC and early 1st century AD, and was succeeded by samian ware, manufactured in a number of centres in Gaul, modern France and Germany. However the definition of all these terms has varied and evolved over the many generations during which the material has been studied. Technically, red-gloss wares have much in common with earlier Greek painted pottery, but the decorated forms employ raised, relief decoration rather than painting. African Red Slip (ARS) ware belonged to the same tradition, and continued to be made much later than Italian and Gaulish sigillata, right through to the Islamic conquest. ARS in turn influenced the production of Phocaean red slip, which is common in the Eastern Mediterranean and also appeared occasionally as far west as Southern France and Britain.